Face it: When you think about missing teeth, the image of the nice old man with the sunken face in the grocery store line pops into your head. But the reality is that missing teeth are a fact of life for the old and young alike. Accidents, gum disease, and cavities can happen to anyone. If you leave dental problems untreated or if you suffer a sports injury or other sudden accident, you may lose a tooth. In fact, missing teeth are not rare. An estimated 120 million people in the United States are missing at least one tooth and 36 million of them don’t have any teeth at all, according to the American College of Prosthodontists. The good news is that advances in dental replacement options have come a long way. Dentures are no longer the only viable option for replacing teeth. 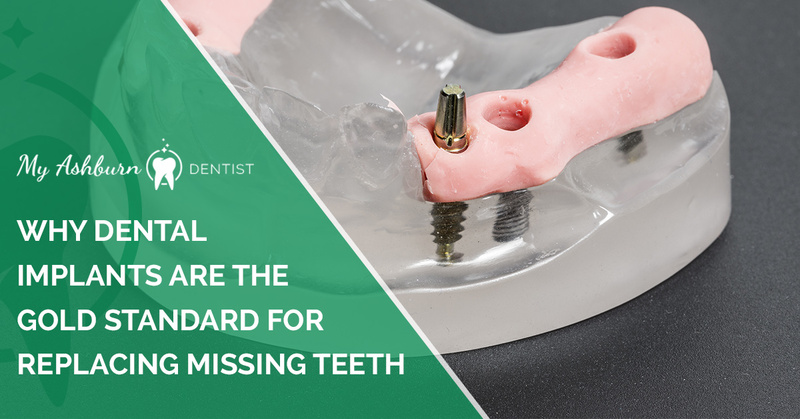 The dental professionals at My Ashburn Dentist in Ashburn, Virginia, share their insights on why dental implants are the gold standard for replacing missing teeth. Unlike dentures, dental implants are a permanent solution — your dentist places them in your jawbone, which bonds with and secures the implants. The physical appearance, texture of the materials used, and the actual mechanics of dental implants so closely match your original teeth that you may forget they weren’t there to even begin with. Say goodbye to the embarrassment of missing teeth and hello to your favorite foods. Think of dental implants as the ultimate do-over. The best part is that unless you tell your friends, no one but the dentists at My Ashburn Dentist will know, and they won’t tell. You can have dental implants placed in a variety of ways depending on your individual situation. Single implants can be embedded into your jawbone to support one artificial crown if you have one missing tooth between two healthy teeth. Likewise, dental implants can support a dental bridge to “bridge the gap” created by several missing teeth between healthy teeth. Dental implants can also secure a full set of dentures, providing more stability than traditional dentures alone. As if versatility wasn’t enough, your dental implants can last a lifetime if you practice good at- home oral care like brushing regularly and, of course, get regular check-ups. Since dental implants are surgically placed in your jawbone, you don’t have to be concerned about slipping and sliding like you might experience with ill-fitting dentures. You also don’t have to deal with messy adhesives. Human nature tells us that if something isn’t convenient or comfortable, it’s not going to make us very happy. Dental implants provide the closest thing to your original natural teeth that you can get. You don’t have to remember to pack them for a trip or worry that they are too loose. Dental implants become your epic second chance — the gold standard — for worry-free eating, speaking, and living life to the fullest. If you’ve been wondering whether you are a good candidate for dental implants, make an appointment for a consultation at My Ashburn Dentist in Ashburn, Virginia. You can schedule an appointment online or just give us a call today.